Thursday – US – Consumer Credit grew $10.9bn in September, below the consensus estimate for a $15bn increase. Thursday – EUR – German Trade Balance narrowed to €17.6bn in September, down from €18.2bn in the previous month. 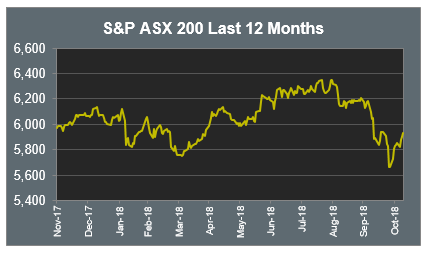 The Australian sharemarket closed 0.5% higher yesterday, with the Information Technology sector (+2.6%) the strongest performer. The Financials were also stronger, with three of the big four banks up 1.8-2.3%, while NAB fell 3.6%, to $24.93, after trading ex-dividend. James Hardie Industries plc (JHX) released 1H19 earnings, reporting a 25% increase in revenue to US$1.4bn. However, the company cut its full year earnings forecast, due to a softer outlook and uncertainty for the US housing market. JHX declined $2.90 to close 14.7% lower at $16.90. The ACCC said it will not oppose the proposed merger between Fairfax Media (FXJ) and Nine Entertainment (NEC), meaning the deal could be completed by December 10. NEC shares closed unchanged at $1.68, while FXJ also finished flat at $0.625. Domino’s Pizza Enterprises Ltd (DMP) provided a FY19 trading update, announcing same-store sales grew 2.9%, a slowdown from the 4.4% growth over the first five weeks of the financial year. DMP closed 11% lower at $49.72. The Australian futures market points to a 0.15% fall today. European sharemarkets were mixed on Thursday. After releasing earnings results, shares in Commerzbank rose 5.4% and Société Générale gained 2.4%. Swiss multinational bank, UBS, rose 1.3%, despite news the US Department of Justice is planning civil charges over the sale of mortgage-backed securities in the run-up to the 2008 financial crisis. The broad based STOXX Europe 600 rose 0.2%, the UK FTSE 100 gained 0.3%, while the German DAX fell 0.5%. US sharemarkets closed lower overnight, with Financials the strongest sector. Energy stocks dragged down the market as oil prices fell to 8 month lows. Shares in semiconductor and chipmaker, Qualcomm, fell 7.2%, after the company forecast revenue below analyst expectations. Shares of home builders eased, after major American construction company, D.R. Horton, warned higher home prices and higher interest rates could crimp demand. The Dow Jones closed flat, while the S&P 500 and the NASDAQ closed down 0.3% and 0.5% respectively. With the cloud of uncertainty caused by the mid-term elections out of the way, attention will now turn back to fundamentals like supply and demand to drive the US equity market. There should be an abundance of demand coming from corporates as share buybacks resume. It’s estimated corporate buybacks will total US$700 billion next year, a 17% increase from 2018. Companies recently in the news because of buybacks include Berkshire Hathaway, following CEO Warren Buffett’s authorisation to purchase shares, which is the first he has done in 6 years. IBM recently authorised US$4 billion worth of buybacks, Intercontinental US$2 billion and Dow DuPont US$3 billion, while Estee Lauder has announced it will be buying back 11% of its shares. After the recent correction, companies may well be eager to snap up some of their own shares at attractive lower prices.